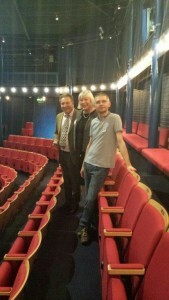 W e recently attended a Suffolk Carbon Charter event @ The New Wolsey Theatre, Thursday 17th September 2015 . The New Wolsey Theatre’s mission is to create, develop and produce a vital and dynamic programme of theatre for all the people of Suffolk and surrounding areas. The New Wolsey team is committed to understanding how its work impacts the environment in order to develop achievable actions to increase sustainable and ethical practice. Recent infrastructure improvements have significantly reduced the New Wolsey’s environmental impact and the company achieved a very well-deserved Silver Charter award in June 2015. We were treated to a tour of the theatre, demonstrating the forward-thinking approaches that the New Wolsey have taken to deliver high quality theatre and comfort to guests without costing the earth. David Watson, Head of Operations told us all more about the theatre´s journey and Neil Daines, Caretaker showed us the fantastic new heating system which has helped them reduce their utility costs dramatically and individually zone areas throughout the theatre so that they only need to be heated when required .